Game System: FUBAR Victorian Science Fiction. During the summer of 1875 the Great Martian Invasion of Earth began! Martian Tripods ravaged the British countryside laying waste to everything that crossed their paths impervious to everything Humanity fielded against them. Unbeknownst to Alien Invaders though, Her Imperial Majesty’s finest troops were being equipped with the latest weapons of war fresh from docks of Liverpool and supplied by the United States of America. With these modern machines of war the British planned to put an end to the Martian Tripods’ rampant destruction of their homeland! During June, five Martian Tripods were identified converging from different directions on the small Essex village of Little Tinkle. 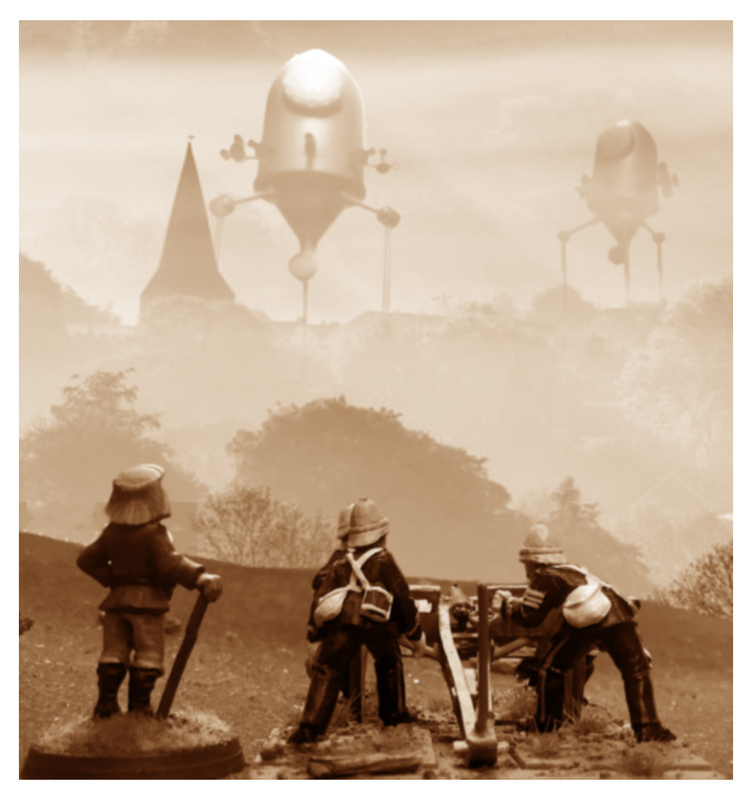 They were shadowed by troopers from the 7th Mechanical Hussars using their new steam driven Marconi Wireless Sets to keep the British Imperial Headquarters up to date with their activities. Using this information, elite Flying Columns were dispatched to intercept the Martians – a single Martian Tripod was hard enough to deal with, let alone several working in coordination! Every effort had to be made to stop the Martian Fighting Machines becoming a united force! Mid morning of June 22nd, Flying Column Z – commanded by the highly decorated Colonel Puddin K.B.E and comprising of elements of the Queen’s Own Steam Dragoons and a flyer from the famous 266 Squadron – located their target to the East of Little Tinkle: the Martian machine designated as “Tripod X’. The Colonel promptly roared the order “Charge!” but his further words of encouragement were drowned out by the thunder of steam engines powering up. Facing the British on the other side of the battlefield with its unblinking red eye glaring ominously, the metallic monster from Mars glided effortlessly forward. The stage was set… the battle began.